For use with Series 21, Series 21-E orSeries 22 -1-AS. The arms of the counter supports can be easily adjusted by an internal suspension (size 1 to 3). 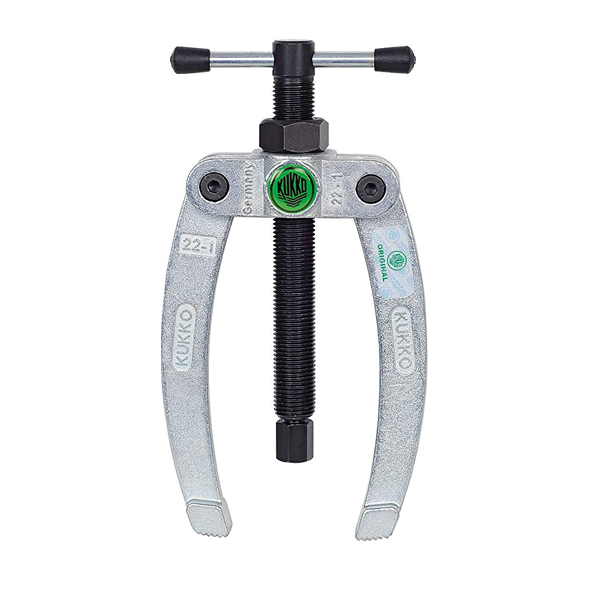 The frictional resistance of the counter support nut is reduced to a minimum by a built-in thrust bearing. The counter supports of sizes (4 and 5) are particularly suitable for large ball bearings etc. with their support feet and ensure a firm footing when pulling out. The counter support can be combined with internal extractors and threaded adapters of the Kukko brand. Screw the internal extractor or the threaded insert into the component. To remove, screw the spindle of the counter support onto the internal extractor or threaded pin. The arms of the counter support must not block the part to be extended, and it must be ensured that the arms are aligned in parallel. Hold the T-handle and at the same time tighten the nut evenly above the cross-bar with an open-end wrench until the component is released from its seat.